The Fall 2015 voyage will feature longer port stays to provide more time for in-port experiential learning, service projects, cultural interaction, and the transit of the Panama Canal, one of the engineering marvels of our world. Italy has something for everyone, whether you’re a history buff, outdoor adventurer, or an aspiring chef. If you’re looking to explore ancient architecture, visit the Roman ruins or the renowned city of Pompeii, preserved by the volcanic ash of Mount Vesuvius. The five consecutive seaside towns of Cinque Terre offer beautiful hiking trails along the coastline and a chance to explore fishing villages. Culinary enthusiasts can learn how to cook in Naples, a city renowned for its Napoli-style pizza. Across the Adriatic Sea from Italy lies the strikingly beautiful landscape of Croatia. The natural beauty and clear water combine with an abundance of medieval towns making this a hallmark of the Mediterranean. 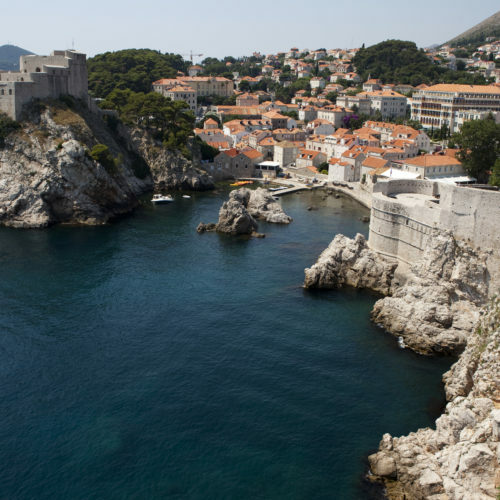 Dubrovnik itself is an enchanting pedestrian city known for its intact city wall and towers; historic churches and museums. The clear waters and abundant marine life make snorkeling a popular activity. The small mountain village of Osojnik welcomes visitors with traditional folk music and food. Split’s waterfront promenade, with café’s, shops and palm trees is often called the “Riviera” of Croatia and the ruins of Roman emperor Diocletian’s palace provide ample opportunities to explore. With more ancient sites than any other country in Europe, Greece is an archaeological treasure. Philosophers and theologians have long been drawn here to explore the roots of modern thought. The vibrant blues and rugged beauty of the Greek Islands beckon many visitors away from the crowds of Athens and the Acropolis. Spain’s diverse landscape, architecture, art, and cuisine make the country rich in culture and charm. We will dock in Barcelona, one of the Mediterranean’s busiest ports, where you can explore the spectacular architecture of the Catalan capital, including Antoni Gaudí’s Sagrada Familia church. Sports enthusiasts will enjoy a visit to Camp Nou, Barcelona’s soccer stadium and home to the Barca team. On the outskirts of the city, you’ll find the Montserrat mountain range as well as beautiful beaches. French-speaking Dakar, Senegal is the western-most city in all of Africa. The capital and largest city in Senegal, Dakar is located on the Cape Verde peninsula on the Atlantic. Dakar has maintained remnants of its French colonial past, and has much to offer both geographically and culturally. Discover the history of the Dakar slave trade with a visit to Goree Island, one of the major slave trading posts from the mid 1500s to the mid 1800s. Bursting with exotic wildlife, the Amazon River, and lush rainforests, Brazil is an environmental wonderland. One of Semester at Sea’s most popular excursions in Brazil is an overnight riverboat cruise down the Amazon River where students visit local villages along the way and sleep in hammocks at night. The ship will dock in the city of Salvador, once the capital of Portugal’s New World colony. Explore the bustling city where you can learn about capoeira, explore 17th- and 18th-century architecture, and see firsthand the preserved African culture through art, music, and dance. Just off the coast of Venezuela lies the small nation of Trinidad and Tobago, an island paradise with dual nationalities. Surrounded by crystal blue waters, the island presents a serene landscape with a lively and colorful Caribbean culture. The Port of Spain offers preserved colonial mansions for inner-city exploring, while remote beaches sporting coconut palms and giant turtles provide the perfect outdoor retreat. Cross another item off your bucket list as you transit through the Panama Canal. Completed in 1914, the 52 mile-long canal is one of the world’s greatest feats in engineering, providing passage between the Atlantic and Pacific oceans. Get an up-close look at the gargantuan locks as you coast through the canal that recently celebrated its 100-year anniversary and is undergoing a massive expansion project. Costa Rica is a small, Central American nation known for its biodiversity and ecotourism, and has become a global hotspot for outdoor adventure. Whether it’s surfing the Caribbean or Pacific coastline, taking in the jungle via zip line, exploring the cloud forests and rainforests, or participating in a guided tour of a sloth sanctuary, Costa Rica has adventure in every corner.